You don’t understand how much thought a business owner has to put into every decision until you are one. For instance, if you run a warehouse, farm, machine shop or anywhere with a shipping and receiving area, you need a garage door. But which one and what to look for? 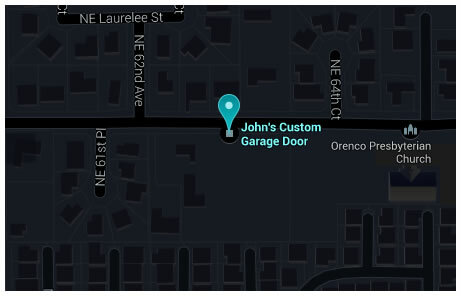 Here at John’s Custom Garage Doors, all we do is provide residential and commercial garage door service in Beaverton and the surrounding area. Follow our advice to help you find the model that’s just right for your needs. Wood: Wood is a resilient material that is also a renewable resource. It’s relatively inexpensive, but not exceptionally strong. You don’t see very many wooden commercial garage doors. The ideal use for a wooden door would be a business with lots of public visitors, such as a retail store. The walls tend to be lower, so you can get away with a heavier material. And the beauty of wood grain improves the aesthetics of your building. Steel: A very strong material, steel is common in commercial garage doors. While it’s naturally susceptible to rust, all standard doors are coated with weather-resistant layers to make them last longer. One thing to keep in mind is that metals are poor insulators, both for temperature regulation and noise. If you’ve got an industrial building located near commercial or residential property, you should invest in insulation if you choose steel. Another issue is that while steel is strong, many doors use thinner gauges of the material, so make sure to check on what you’re getting before you buy. Aluminum: Similar to steel, aluminum has two primary differences. It’s lighter than steel, and it also does not rust. Glass Panes: Transparent glass panes are a stylish and attractive way to highlight your business. If you have a showroom, it allows passersby to get a peek at your inventory, even after hours. Glass can insulate against sound and temperature changes better than metal. Vinyl: Vinyl is a fantastic material overall. It’s not susceptible to rust. Thanks to its resilient nature, it tends to not dent permanently. Vinyl is also a great insulator as well, which is useful if you’re trying to keep noise levels down. No two garage doors are created alike. And no two businesses have the exact same requirements for what they need in a door. Here are some features that can help you make your decision. Openers: Unless your garage door is the same size as a standard home garage door, you need an opener. Otherwise, it’s just too much work to lift it up. Most come with a wired button that you press to open the unit. You can also get remote openers. These are a better option for businesses with delivery bays. You save time and labor by distributing openers to your drivers, who can activate it rather than having to wait for a floor worker to let them in. Extra Insulation: Especially for garage doors made from metal, you want extra insulation. Your municipality probably has some sort of noise ordinance in place. Insulating your commercial garage door in Beaverton can prevent fines. It also saves you on heating and cooling costs in the long run. Fire Rating: You can never be too safe when it comes to your property. Taking appropriate measures to prevent fire damage saves you money, but more importantly, it can save lives. Consider the sort of materials that you keep in your warehouse. Are any of them flammable or explosive? Fire-rated garage doors add another layer of protection to the building. If worst comes to worst, and there is a fire in your business, you could possibly reduce your liability by showing that you took anti-fire measures beforehand, such as installing fire-resistant commercial garage doors. Another factor to take into consideration when it comes to commercial garage doors is the cost over time. For instance, maintenance and cleaning. You could likely take on a few of these projects on your own if you were dealing with residential garage doors. Commercial models are another thing entirely. For instance, if you’re not a properly trained technician, you could likely do more damage than good if you tried your own repairs. It’s a good idea to contract someone to do that for you. If you need a commercial garage door in Beaverton, to whom should you look? The answer is simple, John’s Custom Garage Doors. We’ve got years and years of experience in taking care of installing all sorts of models in local businesses. All of our technicians have the experience to work on any major brand. We come by personally and inspect your property when we install the door to make sure that there are no issues with the setup. Once the door is in place, there’s still the concern of maintenance. We cover virtually any known issue with doors. Does it make too much noise? Does the door stop midway up, or even come down? Perhaps the door won’t move at all? None of this is a problem for the team here at John’s Custom Garage Doors. All you need to do to get the ball rolling is give us a call or fill out the handy contact form on this site. We’ll schedule a free consultation to determine what you need and how to best complete your project. Don’t leave any part of your business in the hands of someone with less experience. Trust in our team to get it done right and on time. Get Your Free Estimate on Garage Door Repairs or a New Installation!